Spring vegetables are something I look forward to each year. Baby potatoes, chives, leeks, peas, broad beans and, my particular favourite, asparagus are just some of the wonderful flavours we can look forward to for the next few months. 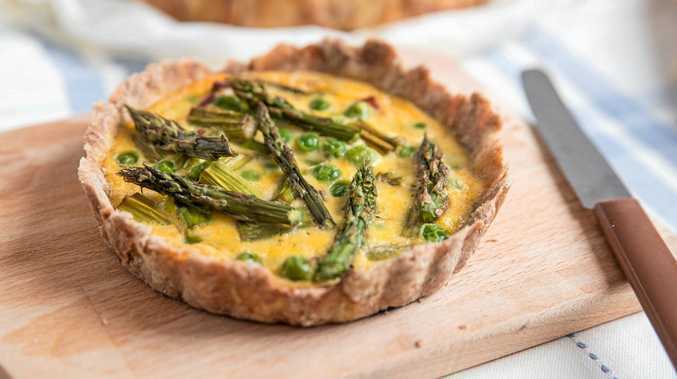 Today's recipe uses an easy wholemeal shortcrust pastry as the base, topped with asparagus, peas and pecorino. Place flour and butter in a food processor and process until it resembles fine breadcrumbs. Add separate egg yolks and ice water and process until dough is formed. Roll out on a lightly floured work surface to 3mm thickness. Cut into four pieces. Lightly grease four 12cm pie dishes. Line each dish with pastry, trimming with a sharp knife. Place in freezer for 30 minutes. Preheat oven to 200C. Place a square of foil in each pie dish and half fill with pastry weights or rice. Place on a baking sheet and bake blind at 200C for 10 minutes, then remove foil and weights and cook for another 10 minutes. Reduce oven temperature to 160C. Beat eggs, milk and cream until combined; season to taste. Divide asparagus pieces and thawed peas between pastry cases and sprinkle with pecorino cheese. Top up with egg mixture. Bake at 160C for 30-35 minutes or until quiche is set. Serve with a salad.